I am back home from my honeymoon, which was fun and wonderful and everything I suppose it should have been. But I can talk more about that later when I have photos to share. Over the last couple months I did get several new toys made, such as the cutie in the picture. They were meant to be listed in my shop when I came back from holidays, but at the last moment decided to send them to a craft sale with my mom. I was curious how they would sell in person, since they are very huggable and photos don't show that very well. So my shop looks a little bare at the moment, but I will soon be knitting madly to get lots done. 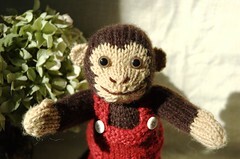 I will also be putting up a listing so people can reserve a spot for a custom-made toy. This way I can make sure I have enough time to get them all done before the holidays, without over-booking my time with last-minute requests. At the same time I am also working on a couple of new patterns. Something like the toys I have already made, designed with the help of a friend. And something very different but equally cute.